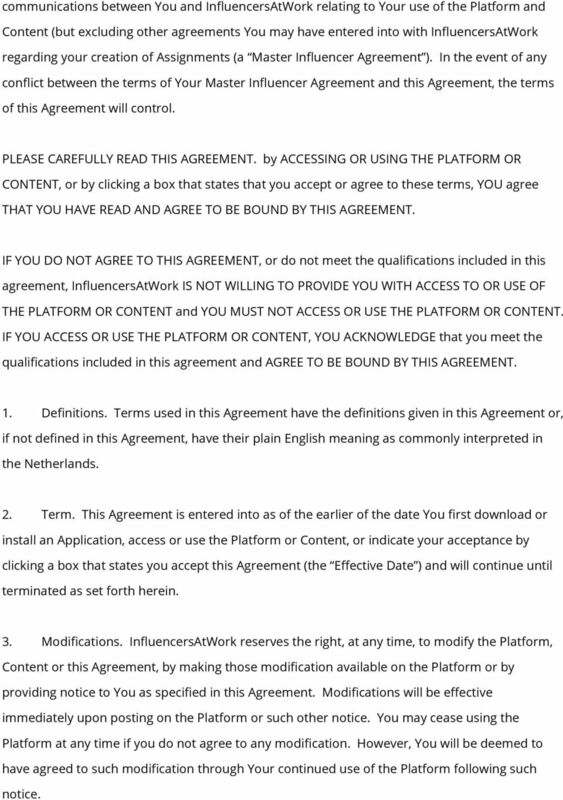 Download "These TERMS AND CONDICTIONS (this Agreement ) are agreed to between InfluencersAtWork,"
2 communications between You and InfluencersAtWork relating to Your use of the Platform and Content (but excluding other agreements You may have entered into with InfluencersAtWork regarding your creation of Assignments (a Master Influencer Agreement ). 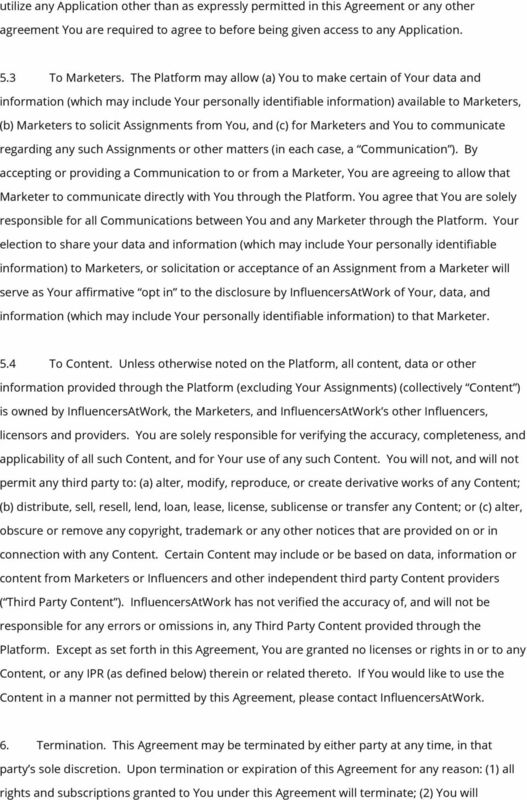 In the event of any conflict between the terms of Your Master Influencer Agreement and this Agreement, the terms of this Agreement will control. PLEASE CAREFULLY READ THIS AGREEMENT. by ACCESSING OR USING THE PLATFORM OR CONTENT, or by clicking a box that states that you accept or agree to these terms, YOU agree THAT YOU HAVE READ AND AGREE TO BE BOUND BY THIS AGREEMENT. 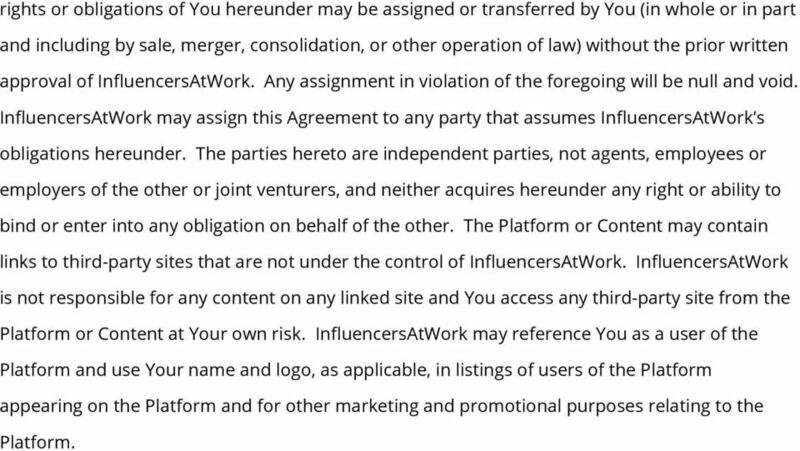 IF YOU DO NOT AGREE TO THIS AGREEMENT, or do not meet the qualifications included in this agreement, InfluencersAtWork IS NOT WILLING TO PROVIDE YOU WITH ACCESS TO OR USE OF THE PLATFORM OR CONTENT and YOU MUST NOT ACCESS OR USE THE PLATFORM OR CONTENT. IF YOU ACCESS OR USE THE PLATFORM OR CONTENT, YOU ACKNOWLEDGE that you meet the qualifications included in this agreement and AGREE TO BE BOUND BY THIS AGREEMENT. 1. Definitions. Terms used in this Agreement have the definitions given in this Agreement or, if not defined in this Agreement, have their plain English meaning as commonly interpreted in the Netherlands. 2. Term. 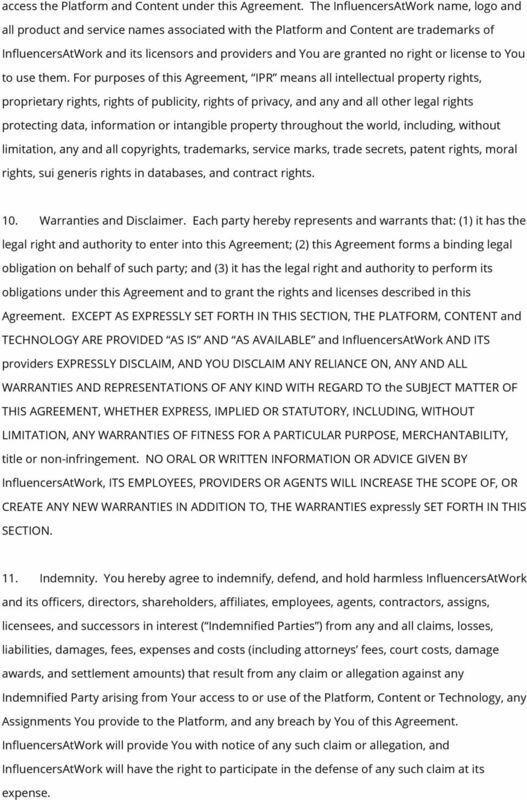 This Agreement is entered into as of the earlier of the date You first download or install an Application, access or use the Platform or Content, or indicate your acceptance by clicking a box that states you accept this Agreement (the Effective Date ) and will continue until terminated as set forth herein. 3. Modifications. 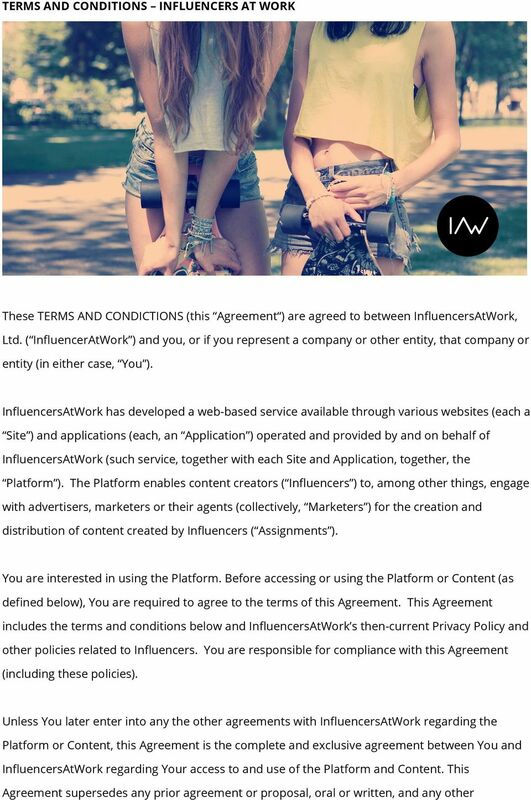 InfluencersAtWork reserves the right, at any time, to modify the Platform, Content or this Agreement, by making those modification available on the Platform or by providing notice to You as specified in this Agreement. Modifications will be effective immediately upon posting on the Platform or such other notice. You may cease using the Platform at any time if you do not agree to any modification. However, You will be deemed to have agreed to such modification through Your continued use of the Platform following such notice. 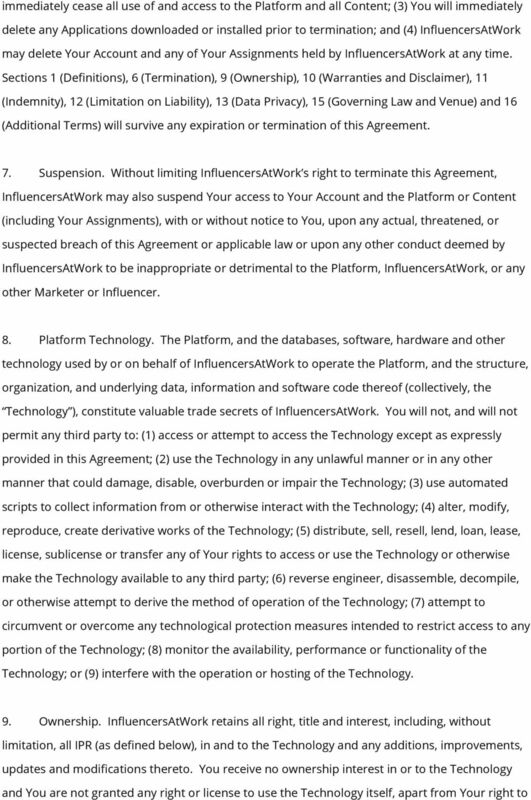 6 access the Platform and Content under this Agreement. 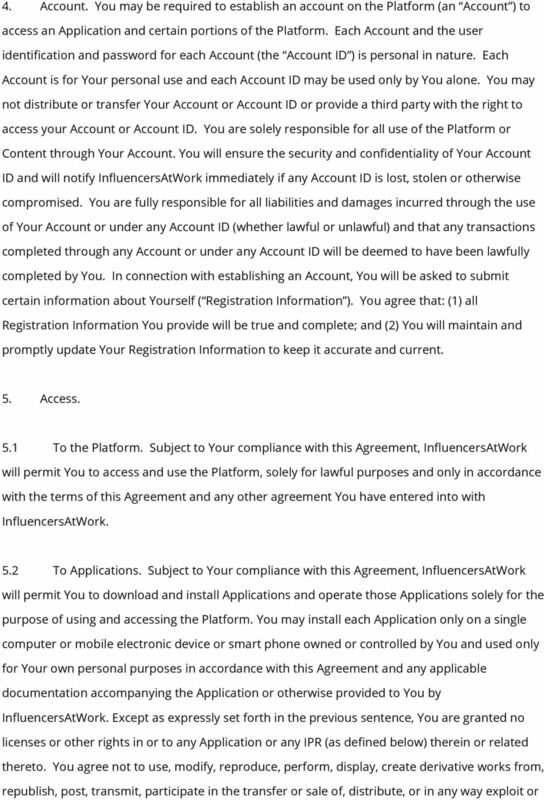 The InfluencersAtWork name, logo and all product and service names associated with the Platform and Content are trademarks of InfluencersAtWork and its licensors and providers and You are granted no right or license to You to use them. For purposes of this Agreement, IPR means all intellectual property rights, proprietary rights, rights of publicity, rights of privacy, and any and all other legal rights protecting data, information or intangible property throughout the world, including, without limitation, any and all copyrights, trademarks, service marks, trade secrets, patent rights, moral rights, sui generis rights in databases, and contract rights. 10. Warranties and Disclaimer. Each party hereby represents and warrants that: (1) it has the legal right and authority to enter into this Agreement; (2) this Agreement forms a binding legal obligation on behalf of such party; and (3) it has the legal right and authority to perform its obligations under this Agreement and to grant the rights and licenses described in this Agreement. EXCEPT AS EXPRESSLY SET FORTH IN THIS SECTION, THE PLATFORM, CONTENT and TECHNOLOGY ARE PROVIDED AS IS AND AS AVAILABLE and InfluencersAtWork AND ITS providers EXPRESSLY DISCLAIM, AND YOU DISCLAIM ANY RELIANCE ON, ANY AND ALL WARRANTIES AND REPRESENTATIONS OF ANY KIND WITH REGARD TO the SUBJECT MATTER OF THIS AGREEMENT, WHETHER EXPRESS, IMPLIED OR STATUTORY, INCLUDING, WITHOUT LIMITATION, ANY WARRANTIES OF FITNESS FOR A PARTICULAR PURPOSE, MERCHANTABILITY, title or non-infringement. NO ORAL OR WRITTEN INFORMATION OR ADVICE GIVEN BY InfluencersAtWork, ITS EMPLOYEES, PROVIDERS OR AGENTS WILL INCREASE THE SCOPE OF, OR CREATE ANY NEW WARRANTIES IN ADDITION TO, THE WARRANTIES expressly SET FORTH IN THIS SECTION. 11. Indemnity. You hereby agree to indemnify, defend, and hold harmless InfluencersAtWork and its officers, directors, shareholders, affiliates, employees, agents, contractors, assigns, licensees, and successors in interest ( Indemnified Parties ) from any and all claims, losses, liabilities, damages, fees, expenses and costs (including attorneys fees, court costs, damage awards, and settlement amounts) that result from any claim or allegation against any Indemnified Party arising from Your access to or use of the Platform, Content or Technology, any Assignments You provide to the Platform, and any breach by You of this Agreement. InfluencersAtWork will provide You with notice of any such claim or allegation, and InfluencersAtWork will have the right to participate in the defense of any such claim at its expense. 9 rights or obligations of You hereunder may be assigned or transferred by You (in whole or in part and including by sale, merger, consolidation, or other operation of law) without the prior written approval of InfluencersAtWork. Any assignment in violation of the foregoing will be null and void. 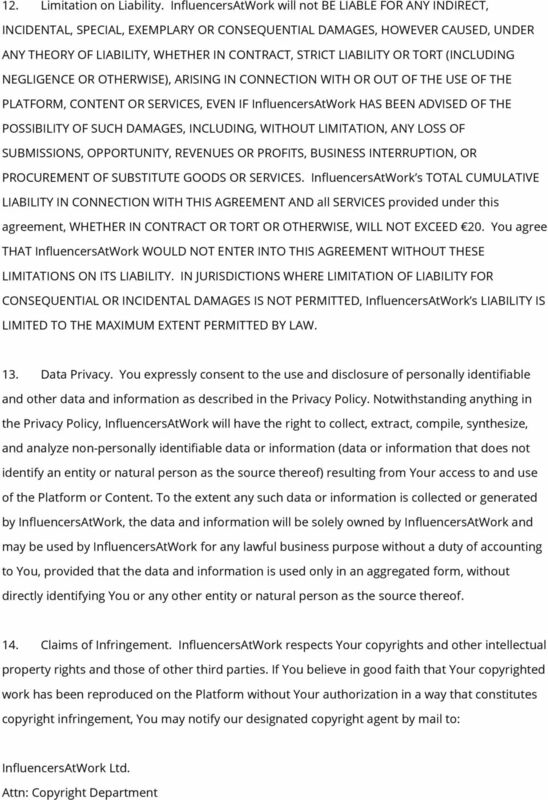 InfluencersAtWork may assign this Agreement to any party that assumes InfluencersAtWork s obligations hereunder. The parties hereto are independent parties, not agents, employees or employers of the other or joint venturers, and neither acquires hereunder any right or ability to bind or enter into any obligation on behalf of the other. The Platform or Content may contain links to third-party sites that are not under the control of InfluencersAtWork. InfluencersAtWork is not responsible for any content on any linked site and You access any third-party site from the Platform or Content at Your own risk. InfluencersAtWork may reference You as a user of the Platform and use Your name and logo, as applicable, in listings of users of the Platform appearing on the Platform and for other marketing and promotional purposes relating to the Platform.